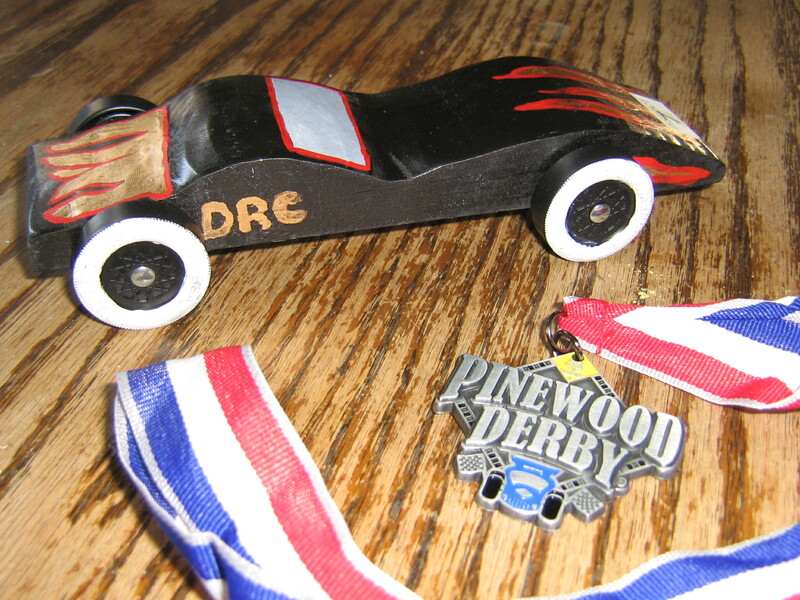 Boy Scout Derby Car races have been held for as long as the scouts have existed – or so it seems. It is a long held tradition with boys. Derek was a scout when he was a boy, so he was nearly as excited to work on this car with his son as Drake was to work with his Dad. Drake began with big stars in his eyes. He wanted to leave with top prize. Derek was just hoping to finish it in time and have wheels on the thing before race day! The day of the race, Drake was up way before dawn and was pestering me as to when his dad would arrive home from work. It was 5:45 in the morning, and an hour I can never wrestle him out of bed for school each and every day… but here he stood completely dressed and ready to work on finishing touches for the race (that was to begin at 10 a.m. mind you). When Derek walked in the door at 6:20 a.m. Drake was at his side instantly and chattering away. He was full of ideas and “can we’s” and never stopped talking from the moment he started. The car was finished (on time, complete with wheels) and as a family we went off to the race. He sat with fingers crossed beside a friend, and they watched their cars race throughout the morning. Drake surprised us all by taking home a medal. He placed 2nd in the Tiger Den participants, and 8th overall out of 35 cars. And as excited as he was to receive his medal, he was wistful he did not take home that massive trophy. There’s always next year buddy! But the prize he doesn’t see, but is hidden away in his heart, is the huge trophy-towering love of his father. Derek was up 24 straight hours so that Drake would have his dad at his side for the big race. Working 3rd shift means that often you miss things in the day, or you dont sleep. There was no way to miss this day… so sleep was last on the list. He worked for hours with Drake, and much time in prep without him, so they could finish this project on time. Was it worth it? The huge cheesy grin on the freckled faced redheaded boy is a resounding answer. Absolutely worth it.